Swansea Libraries 2.0 came into being as a result to a cut in marketing budgets. The consensus of opinion was that although it was understood the need to reduce spending there was still a need to try and ensure the information regarding services, events and activities available at libraries needed to continue in some form. The new service realigned the multiple facebook accounts into a single Swansea Libraries page, and reduced the Twitter accounts to two, one for the general library service and one for the virtual enquiry service ‘Library Line’. Control of the existing blog was handed over to a small team of staff and the blog was temporarily halted for a re-launch in 2012. All social media content then became part of a single team who had editorial control and provided a consistent approach to the branding and ‘voice’ for the media. 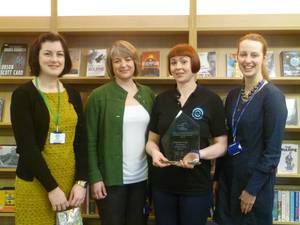 Swansea Public Libraries were awarded First Place out of the Public Libraries in the competition. What is in the water in Swansea! The narrative introduction of the entry sets out a scenario of difficult economic issues and budget cutbacks – and then departs on a marketing master class! The aims (perhaps too many?) are well constructed and the objectives are SMART – so a great foundation to build a campaign – especially building on existing brand awareness vehicles (Read more, relax more etc.). However it is the use of new media and in particular social media that makes this the top entry. Very creative throughout and highly professional the executions achieve the goal of ‘community building’ within the audience – no mean feat this and would put many large commercial organisations to shame. The creation of the ‘you tube’ ads is quite brilliant (although it looks like low numbers at this stage). The entry scored top marks in all of the categories and I would recommend to the team that they consider making a submission to the CANMOL Wales Marketing awards later this year.